Teen Paddle 2019 --July 15-19 -- REGISTRATION OPENing March 15, 2019! Teen Leadership Paddlers in the News! What is the "Teen Paddle"? ​The Teen Paddle is a week long canoeing expedition geared towards high school students. 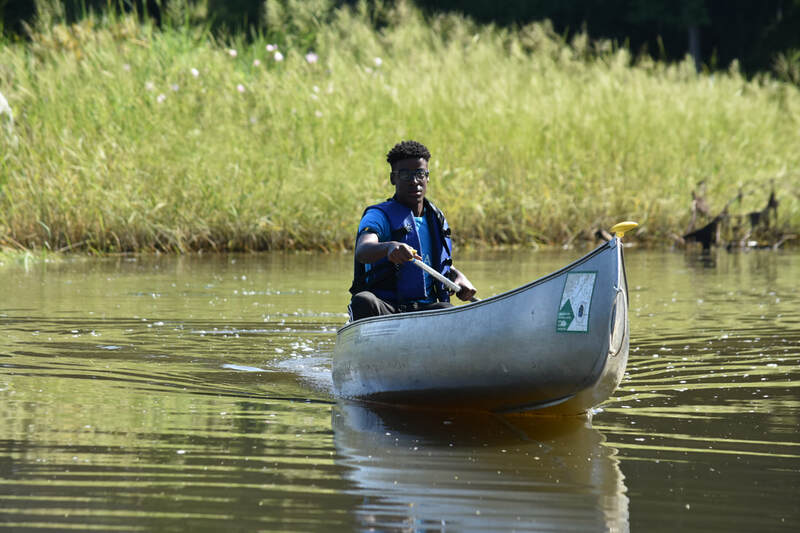 The program gives teens a chance to practice leadership & teamwork skills as they navigate the river, water quality testing, plant community studies, help with a stewardship project, camping by the riverside and prepare meals together. Paddlers enjoy a unique, on-the-water experience that features educational programming and builds a strong stewardship ethic for the river and its natural resources. Campers will become immersed in Patuxent River issues and explore their role in solving them and they end the week with a presentation to county and state leaders, friends and family. Day 1 of camp begins for a day at the Jug Bay Wetlands Sanctuary where we will introduce paddle safety and leadership skill building. Monday, Tuesday, Wednesday and Thursday will be our over night camping adventure as part of the "marsh life" of the Patuxent River. Campers stay in large group tents, prepare meals with a gas stove and have limited running water at most camp sites. Campfires are a nightly event and s'mores are guaranteed. Campers blog about their experiences for loved ones back home to enjoy while they are away and the Friday afternoon presentation at Patuxent River Park for friends, family, and park visitors is a MUST SEE! "At the beginning of the first day I was really unsure about how this adventure was going to turn out... We got to go canoeing in the afternoon, and...I was very nervous at first, mostly because I had never been in a canoe, or the [one in charge of steering] one. After much frustration I finally got the hang of it . As my mom drove away, I thought of all the future fun I was going to have."